At home during either design verification or on the production line, the Agilent 6643A high-performance power supply is designed to excel in the most demanding test requirements and is especially capable in automated test applications. It adeptly gives the user precise control over a range of output power levels, offering high accuracy combined with fast measurement capabilities. Fully programmable and equipped with a variety of standard features, this power supply is known for lowering test times and simplifying the test system design. The well-respected Agilent 6641A-6645A series power modules also offer speedy, lowered noise output. They involve analog specific control of output current and voltage. The fan speed control is utilized to lower acoustic noise. Parallel connection of multiple units can be utilized, as well as other protection features that offer additional safety and ease of use. Also included are built-in measurements and highly advanced programmable features, making them very in demand for simplifying system design. Other quality features include having built-in DMM that permits higher accuracy in measurement capability. Marked enhancement is achieved via the active down programmer that can speedily remove any energy from the unit under test when the output is programmed to zero. Additionally, an extended remote sensing capability helps compensate for voltage drops in the load leads. This minimizes problematic source and measuring inaccuracies resulting from resistance in the load wiring. Additionally, it can produce 40 W to 6600 W outputs of up to 120 V and up to 875 A. Speedy, low noise outputs hike the test throughput. Their programming capability is extensive, thus enabling a flexible system design. Computer control can be achieved via GPIB. For a higher production yield, quick protection features are available which include speedy crowbar and protection for mode crossover. Programming protection features as well as the DC output is achieved by using the direct front access panel, or through SPCI signals in combination with the GPIB. 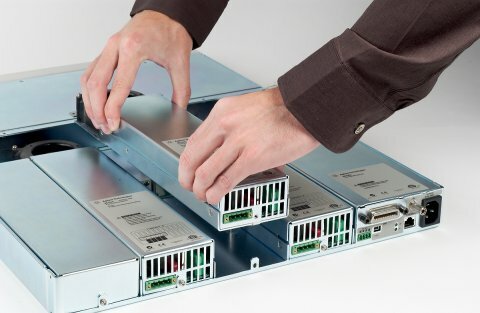 By employing the serial link, its simple to connect one GPIB address with up to 16 power supplies. When using the VXI plug and play drivers, accelerated testing system integration is an easy task. Control of the output current and voltage can also be done using analog signals. Basically this can be of particular help in particular in high noise environments. Users repeatedly mention to us that the Agilent 6634A helps maximize their laboratory bench productivity and reduces their reliance on additional high cost test equipment. Buying a quality used or refurbished Agilent 6634A supply can be very good alternative for a modern laboratory, offering cost savings and reliable performance. This entry was posted in Site News and tagged Agilent 6643A. Bookmark the permalink.